With its reputation for luxury, and talented personnel providing best-in-service experience, InterContinental Sydney is well situated to capitalise on the growing Chinese tourism market. InterContinental Sydney has been providing world-class accommodation in Australia’s largest city for more than three decades. Residing in the historical former Treasury Building, which was originally built in 1851, the hotel certainly looks the part of a luxury hotel, and the spectacular views of the Harbour, the Sydney Harbour Bridge and the Opera House add to its appeal. Watching the sun rise over Sydney Harbour is one of the better ways to start the day. 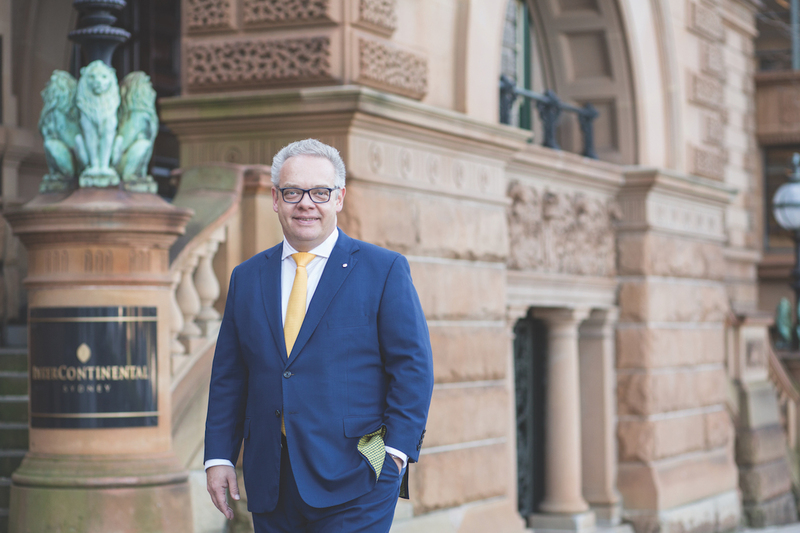 With nearly thirty years’ worth of experience in the hospitality industry, GM Jörg T Böckeler knows how to ensure InterContinental Sydney continues to provide consistent best-in-service experiences to guests. “Early on I became very passionate about my personal vision for hospitality. To this day I have remained curious about the industry, its trends and the pace at which the economy influences our business,” says Jörg. Jörg knows that building and maintaining a reputation for luxury is about more than the accommodations. He began his career in a three-Michelin-star restaurant in Germany, where he became “passionate about good food and its place within the hospitality industry”, so it’s no surprise that InterContinental Sydney is a destination for fine dining. 117 Dining recently won a ‘Best Luxury Hotel Restaurant’ at the World Luxury Restaurant Awards 2016. InterContinental Sydney is also renowned for its High Tea at The Cortile. And the hotel is perfectly placed for its partnership with the Sydney Symphony Orchestra, providing pre-performance dining experiences for concert goers just a short harbourside stroll from the Sydney Opera House. 117 Dining recently won a ‘Best Luxury Hotel Restaurant’ at the World Luxury Restaurant Awards 2016. Last year, the InterContinental Hotels Group, in partnership with Oxford Economics, conducted a global study about the future of Chinese travel. They found that increasing household incomes in China will make travel more affordable, with Australia expected to experience a huge growth in the number of Chinese tourists visiting our shores. In preparation, InterContinental Sydney has been implementing its ‘China Ready’ program. At InterContinental Sydney, the workforce is trained in various departments and skills to give them a solid grounding in hospitality. Jörg knows from his own experience that it is important to develop core hospitality skills from the ground up, in order to instil a focused service attitude.